Aggregating the intelligence inherent in amateur enthusiasm and professional knowledge leads to innovation. It's not the greatest name in the world, but it'll do. More accurately, it's ''aggregated intelligence'' since it's really the product of a bunch of individuals and not a ''crowd.'' And it's at its most powerful when disparate and diverse elements and interests come together (virtually) to solve or just work on a single issue. But nomenclature aside, Howe is an interesting writer and fine reporter. The text follows his intellectual curiosity as he seeks ways that a diverse multitude acts in concert to predict winners of political contests, solve scientific challenges, distribute music, design clothing and conduct all manner of commerce. It's interesting to me, because some of his findings are decidedly counterintuitive. For example, non-experts in a variety of fields — engineering, for example — can find solutions to problems that may elude dedicated professionals. In many professions, including journalism, debates about professionals and amateurs abound. Howe establishes that amateur enthusiasts have historically made major contributions to their respective fields. In many instances, their work surpassed the efforts of dedicated professionals. But then, as now, professionals resisted, ridiculed and attempted to devalue the work of nonprofessionals. 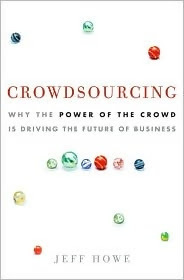 Whether they're political bloggers, after-hours amateur computer researchers, virtual collaborators or fans, engaging the power and enthusiasm of these ''crowds'' is a challenge that many legacy companies like IBM, Procter & Gamble have embraced. And a growing number of new enterprises — YouTube, Facebook, iStock, Marketocracy — were built the same way.